Issues of child custody and parenting time are of the utmost concern to parties in the divorce litigation or the FD litigation. While the parents of the children should act in the best interest of their children, they do not always do so in the heat of litigation. Barring one party being declared an unfit parent, joint legal custody is typically granted by the courts. Joint legal custody provides both parties with the right to make decisions equally on behalf of the child and/or children, such as religion, education, medical decisions and the like. Joint legal custody is not physical custody. Sole legal custody means one party is granted the sole right to make all decisions on behalf of the child without the input of the other party. This is typically when the other party is unfit in some way such as mental health issues, drug issues incarceration, abusive behavior or the like. 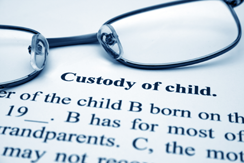 The term “physical custody” is not typically used in the State of New Jersey. Most parties have joint legal custody with a parenting time schedule which designates the “residential custody” of the child and/or children. A determination of the parent of primary residence and the parent of alternate residence are typically determined by the parties parenting time schedule. The parenting time schedule determines with which party the child resides more during the year. That party is designated as the parent of primary residence. This is a legal term utilized when the parties do not share equal 50/50 parenting time. Most parties reach agreement on a parenting time schedule with their children but when they do not, they will be ordered by the court to attend mediation. If mediation is unsuccessful and the parties cannot reach agreement, the court may order a best interest evaluation. Best interest evaluations require the hiring of an expert and the cost can be substantial. When you contact The Law Office of Eileen M. Foley, she will discuss with you parenting time schedules and the best way to resolve the same. Contact her today for a consultation.